The Arts and Crafts Furniture Movement had its beginnings in mid-nineteenth century England. The movement was a reaction to the shoddy quality of furniture, decor and accessories that were being turned out by mass producers of the day. It was also a departure from the elaborate Victorian designs with their gratuitous decorations. "The beauty of Arts and Crafts Furniture exists in its simplicity and quality." In America, architects and designers such as Frank Lloyd Wright, Gustav Stickley and his brothers and Henry and Charles Greene were busy turning the English Arts and Crafts movement into the American Craftsman movement. Wright designed buildings and homes that made use of the rectilinear design elements of the English Arts and Crafts but added new perspectives to the earlier products from England. Wright looked at natural light and exposure. He fit the structure to the land and used natural building materials such as wood, rock and grass. He designed furniture that would work with his open styles. Greene and Greene brought elements of the southwest, the Native American and Mission to the clean straight lines of Arts and Crafts Furniture. The brothers were located in California where they and others were developing the American bungalow, a concept borrowed from India via military men returning to England. Sears Roebuck and Company, among others, would soon be selling factory made numbered kits from their catalogues and shipping them all over the country. The efficiencies of scale and modern production techniques made these houses affordable for most Americans. William Morris, one of the founders of the original Arts and Crafts Movement, would have been appalled at this irony since his idea was to have artisans and craftsmen build quality arts and crafts furniture at affordable prices. American Craftsman furniture was usually designed with straight simple rectilinear lines and had little, if any, added adornment. The beauty of the furniture was in its simplicity and quality, not in unnecessary doodads. Most American Craftsman was made from quarter sawn and rift cut oak. There are examples of cherry and other woods, however. The Greene brothers used wooden pegs to hold their chairs together and mortise and tenon joints on their case pieces. The Arts and Crafts Movement was not a cohesive organized movement. What the various designers had in common was a dedication to quality and simplicity. The arts and crafts furniture that Stickley was making on the east coast shared the boxiness of the Greene companies furniture. However, the Greenes incorporated inlays borrowed from Native Americans in some of their furniture. They also developed collections of Mission style furniture that was far more rustic than most Arts and Craft furniture. Mission, by the way, is not Arts and Craft. It has been lumped in with Arts and Craft but true Mission is very rustic and utilitarian and often made from whatever wood was in the area, including ponderosa pine. By 1925 or 1930, the Arts and Crafts trend had about run its course. But, while the arts and crafts furniture and accessories’ popularity may have ebbed and flowed, it never died. American bungalows are still very popular. People buy them and restore them or modernize them as they see fit. Some home builders are now building old fashioned looking modern bungalows in new trendy neighborhoods. Stickley is still manufacturing and selling its heirloom arts and crafts furniture in large quantities as are other companies. So, if you are looking for new Arts and Crafts furniture, just Google it. There is plenty of it online. Ditto if you prefer antiques. Most major cities have local shops selling new and used Mission and Arts and Crafts furniture. 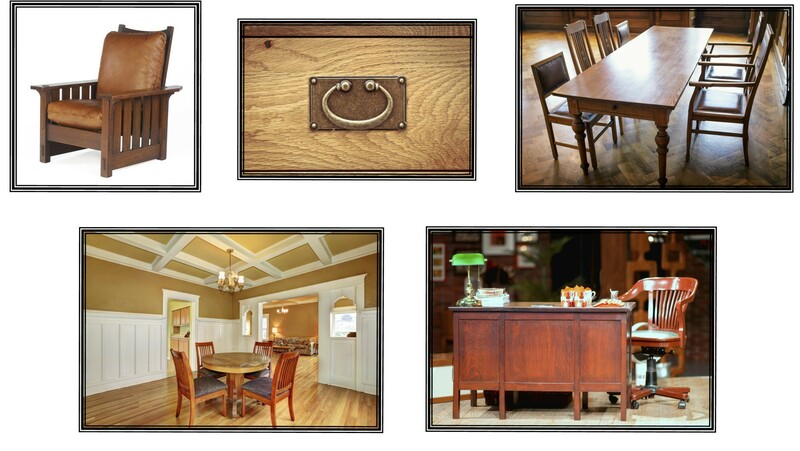 (find local furniture stores in your area) Stickley has their own stores selling reproductions of their original designs. If you are interested in high quality and not just the look, I recommend avoiding the deep discount stores. Usually, the mortise and tenons and the wooden pegs are just decorative. If you are interested in studying the history of the movement in more depth, including its social agenda, libraries and independent book sellers usually have a wealth of resources. Here is more information about Frank Lloyd Wright courtesy of the folks from Artsy.